Bridal Bee's Blog on Flower Girls & Beyond: Save BIG on Flower Girl Dresses! Save BIG on Flower Girl Dresses! Wedding season is fast approaching and if you're looking for a discount flower girl dress, take a look at Nancy August’s selections. Their Big Sale features affordable flower girl dresses and more that are discounted up to 50% off of the original retail price. Find an affordable flower girl dress that fits your budget or a beautiful summer dress that won't break the bank! Just remember that their special Big Sale prices are only for selected items that are available in a very limited quantity. If you see the perfect dress you've been looking for, you should grab it before it is gone! 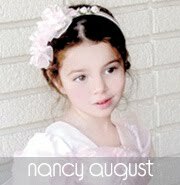 Shop on NancyAugust.com now for their huge selection of flower girl dresses and start saving away! This elegant white flower girl dress is simply stunning! This number features a beautiful ivory matte satin bodice accented with dainty faux pearls, a contrasting adjustable waistband, and a beautiful organza skirt with additional crinoline-netting underneath for a fuller skirt. Whether she is a flower girl, the birthday girl, or simply attending a special event, this elegant white dress is the perfect choice to make it a day to remember! This classic red organza flower girl dress features a sensational sleeveless style with a triple layer skirt. This beautifully simple red organza knee length dress also comes with an adjustable sash that ties in the back. Like many of our special occasion dresses, it is versatile and can be used as a flower girl dress, pageant dress, or even as a holiday party dress. No matter the occasion, this will make your little flower girl even more adorable and irresistibly stunning. Take a look at this black flower girl dress that features a triple flower delight at the waistline. This fully lined organza dress has additional netting underneath for a fuller skirt. Your little flower girl will be the belle of the day in this wonderful black flower girl dress. Whether she is a flower girl or simply attending a special event, such as a graduation or a holiday party, this beautiful black dress is the perfect choice to make it a day to remember. 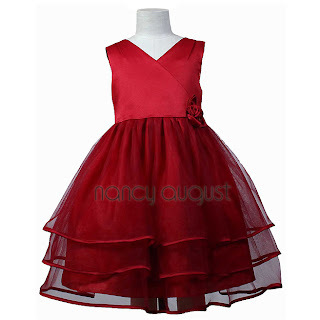 For more flower girl dresses, make sure to visit NancyAugust.com. Have fun shopping! Dupioni vs. Shantung: What's the Difference?